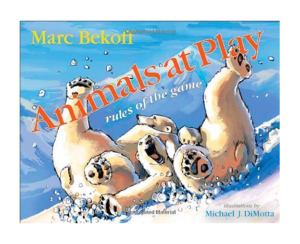 Reading Animals at Play is a wonderful way to introduce kids to the concept that animals are more than cute and fuzzy— they are emotional, intelligent and have something to say! It’s sort of like a mini encyclopedia with whimsical illustrations and an activity at the end that really is the point of the entire book—becoming a beginner ethologist (someone who studies animals). I loved that part. It’s a book that doesn’t just end … at the end. It gives you a way to use the information with your child. My son and I had fun watching the squirrels out on the sidewalks, and the dogs at the parks, and guessing what they were “saying” to each other based off the things we had read. At 4.5 year old, he had fun learning and questioning the facts, but his attention span was a bit underdeveloped for this book. It’s more informational than story driven, and thus probably best for 6 year-olds and up.